﻿ Commissioner DePratter Not Running Again: "I have things to do. You understand?" "I have things to do. You understand?" COLUMBIA COUNTY, FL – Last night, after Tim Murphy's County Wide Economic Development Summit, your reporter asked Commissioner Rusty DePratter if he was running for a third term. Elected in 2010, Mr. DePratter will have served two terms and joined the County 5 during the third year of legendary Commissioner Jody DuPree's first and only term. 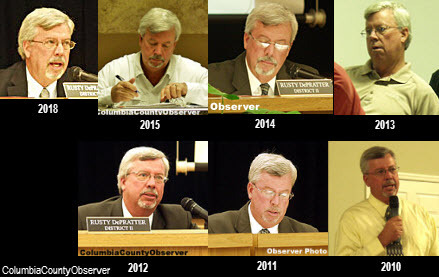 Commissioner DePratter through the years. 2010 photo: Mr. DePratter on the campaign trail. 2013: not always easy to stay awake. 2015: chair of Economic Development Advisory Committee. During the next two years, between Mr. DuPree and District 1 Commissioner Ronald Williams, the County 5 was in a heightened state of nastiness and its reputation for its unruly behavior and disrespect for its citizens was spreading far and wide. Commissioner DePratter, who came from the private sector, lent an even temper to the unruly twosome. Commissioner DePratter throughout his tenure maintained his civility, was even tempered, and returned phone calls. This year, even after being slammed and double slammed by the local mainstream media, Mr. DePratter maintained his even demeanor. However, it is not over yet for Commissioner DePratter. As a lame duck, he is free to speak his mind and not worry about re-election. It will be interesting to see how Mr. DePratter wraps up his eight years of elective service. The Columbia County Observer and the people that work with us wish Mr. DePratter well in his continuing journey. And on a personal note: "Rusty, I do understand."